Following on from my previous post about comfort food, last night was the Slow Food pot luck. 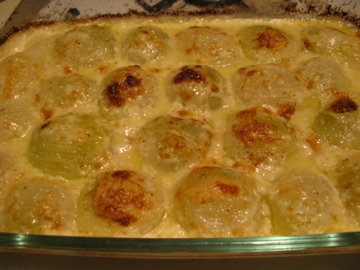 I made a Nigel Slater recipe Baked Onions with parmesan and cream, which he kindly has online. I used smaller onions because I knew there would be lots of food and people would just want small tastes. I doubled the quantities but then reduced the amount of cream. Mine took longer than he said to brown and I ended up turning up the heat, but the result was delicious and they were one of the things to disappear. There was a fantastic range of foods at the pot luck from homemade breads, soups, risottos and even mini- PB&J sandwiches. Interestingly, there were not very many desserts: apple crisp, chocolate chip cookies and a cheesecake. The most popular comfort food was Mac and cheese and there were three or four different variations. There was also a show-down on chicken paprikash with spätzle. The local food highlight I think has to be Peter’s banana bread made with bananas from Franklin Park Conservatory, our local botanical garden. Shame he didn’t find any nuts in Goodale Park. My two favorites were homemade flax seed crackers based on a recipe from 101cookbooks. Jane used a mixture of white and whole wheat flour instead of the semolina and the whole wheat flour came from the Flying J farm. I am definitely going to try making them myself (finally a use for that bag of flaxseeds in the cupboard) and I think it would be a great use for a pasta machine. My other favorites were Michael’s lentil soup (with miso, marmite and slow cooked greens) and Bear’s daube made with ratte potatoes. I somehow found room for seconds of both. There were quite a few squash dishes: a tasty gratin and a mole with squash. Some of the other dishes that were popular were risotto with short ribs, Liesl’s mac and cheese, Zach’s home-made ravioli, pumpkin soup with curry, turkey meat-loaf and the chocolate chip cookies. I am sure I missed some other great things – there was really too much to taste everything.